What if there are no known flies? What is Queensland fruit fly (Qfly)? 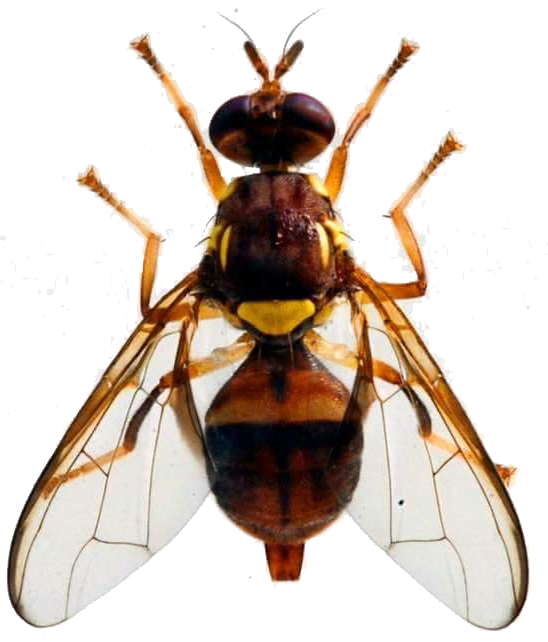 In Australia there are 2 main species of fruit flies – Queensland fruit fly (Bactrocera tryoni) and Mediterranean fruit fly (Ceratitis capitata). Queensland fruit fly (Qfly) can be found in some areas of the east (Northern Territory, Queensland, New South Wales and Victoria) and Mediterranean fruit fly occurs only in the west (Western Australia). Qfly is mobile over short distances on a day-to-day basis. They can potentially move from orchard to orchard, for example, or from native host plants into fruit and vegetable–producing regions. Managing Qfly is difficult because they can infest many crops, plants and weeds (they are ‘polyphogous’). Qfly is native to Australia, but is the most serious insect pest of Australian horticulture. Having a large host range means that more than three quarters of Australian fruit and vegetable exports are susceptible. 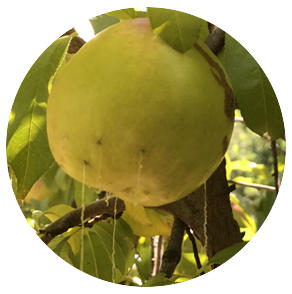 Without appropriate control, production losses and fruit damage can be very high. Why should I care about Qfly? Is it a serious threat? Qfly reduces your ability to produce clean fruit. Adult female flies lay eggs into maturing fruit, which hatch inside the fruit, and the larva feed within the fruit. When the female ‘stings’ the fruit to lay eggs, a wound or ‘sting’ mark can result. 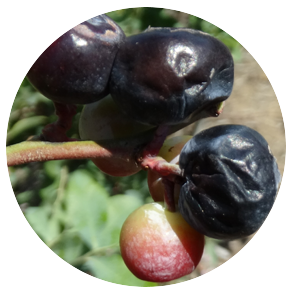 Whether you are a commercial or backyard grower, no-one wants to lose fruit to this pest. Qfly also affects market access opportunities for commercial producers. Producers need to manage Qfly in-field to ensure fruit is clean, and free of Qfly. There are regulations and additional postharvest treatments that growers have to comply with to satisfy their trading partners. There are 4 stages in the life cycle: adults, eggs, larvae (i.e. maggots) and pupae (i.e. chrysalises). An adult Queensland fruit fly can be up to 8 millimetres long, with a red to dark brown body. The fly has a narrow waist between the thorax (the middle section of the body, between the head and the abdomen, with the legs and wings) and the abdomen. The thorax is patterned with cream to yellow shoulder markings and stripes. The wings are transparent. The female can be identified by the ‘sting’ at the tip of the abdomen (called the ‘ovipositer’). Unlike other flies, Qfly can survive the winter (‘overwinter’) as adults, becoming active again as temperatures increase (temperatures around 16 degrees Celsius or above induce flight). After emerging from pupae, or from overwintering, the flies need protein and sugar to sexually mature and to mature eggs after mating. Flies can occasionally been seen walking around plants early in the morning looking for protein, but rest during the hottest part of the day, usually within leafy canopies. Mating occurs at dusk. Female flies generally only mate once, but can mate multiple times. They lay up to 20 eggs, about 2 days after mating, into maturing fruit still on the tree or vine, but not into rotten fruit. Adults can live for many weeks, or even months, depending on environmental conditions and availability of food. Eggs are not easily visible as they are deposited within fruit, often laid just beneath the surface of the fruit, under the skin. There is a small mark left on the fruit, called a sting. Eggs are small (up to 1 millimetre), cream to white in colour and banana-shaped. Eggs hatch within a few days. Once hatched, larvae remain in, and feed on, the fruit. There are 3 larval stages, and larvae grow from about 1 millimetre to 10 millimetres. Colour develops with time to a creamy white. Larvae are legless, and can sometimes have a dark stripe running the length of the body. The body tapers at one end where the darkened and hardened hook-like mouthparts are present. These mouthparts help tear pieces of fruit that are small enough to consume. 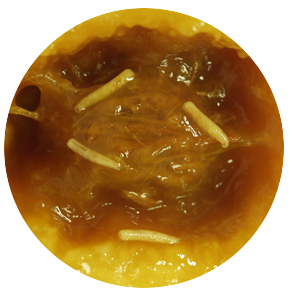 Damage and any rotting within the fruit is often not immediately visible from the outside because larvae feed towards the centre of the fruit. During this, the fruit may fall from the tree or vine. Once larvae have completed their development, they leave the fruit and burrow into the soil. Larval development can occur in as little as 1 week if conditions are optimal. Once the larva leaves the fruit, it drops to the ground to pupate in the soil. The pupal shell is brown. The pupa then develops into an adult fly, ready to emerge when environmental conditions are suitable. Larval and pupal stages can be completed in as little as 2 weeks, depending on temperature. The adult flies may emerge from the pupae in as little as 7 days during the summer, or after several weeks in cooler seasons. 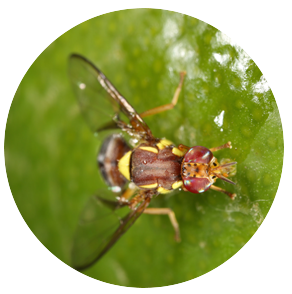 Queensland fruit flies are different from the small, dark brown Drosophila flies (also called ‘vinegar flies’ or ‘ferment flies’) that loiter around ripe and decaying fruit. Drosophila flies are not agricultural pests. Why is Qfly a challenge to manage? Qflies can lay eggs into many different plant types, so have a very large range of hosts (called ‘polyphagy’). This means they are a problem to many of the horticultural industries in Australia because they reduce produce quality and people’s market access. Qflies can move short distances. This means that, even with appropriate management within an orchard, flies can still be present (if they fly in from surrounding orchards, native vegetation or urban fruit trees) and show up in monitoring traps. This challenge highlights why AWM is ideal for mobile pests. Qflies are capable of multiple life cycles each year (called ‘multivoltine’). Because there could be different life stages of flies at any one time, they are harder to manage. In some horticultural production regions in Australia, Qfly could have up to 5 generations a year. They have a large geographic and climatic range. Qflies are present throughout the eastern states of Australia, except Tasmania. Having ‘host status’ means that the host plant can support the full life cycle of the fly. Qfly has a wide host range, which makes managing them difficult. They can use a wide range of horticultural crops, garden plants, native plants and weeds. 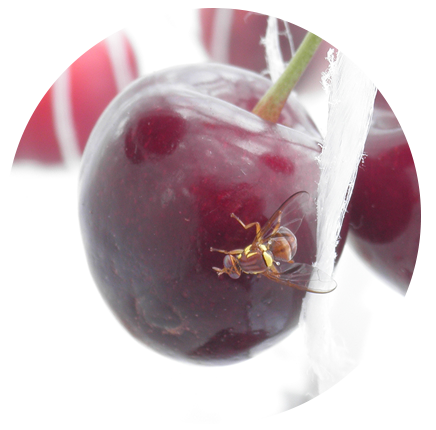 Fruit flies can attack and damage most kinds of soft-skinned fruits and some harder skinned crops as well. It does not matter if the fruit are in a large orchard, or on one tree in a backyard. Sometimes poor hosts are referred to as having ‘low host status’ or being ‘less preferred hosts’. Grapes are an example of this, but still can support Qfly though to the adult stage in a number of varieties. So while considered a poor host, they are a host nonetheless. Being a poor host gives some advantage when Qfly numbers are low, but when Qfly populations are larger, even less preferred hosts (such as table grapes) can be attacked. ‘Host susceptibility’ relates to the period of time that the host is susceptible. 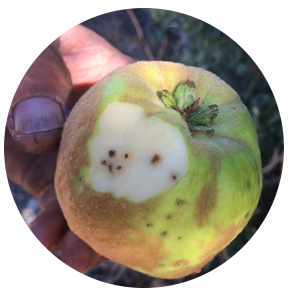 For Qfly damage, this is generally when fruit is maturing and getting soft. Different crops mature at different times, so across an area there may be a prolonged period of host susceptibility. If a crop is a mid- to late-season commodity, you might want to know where in your surroundings early-season commodities are growing. These could harbour fly populations that can infest your crop later in the year. 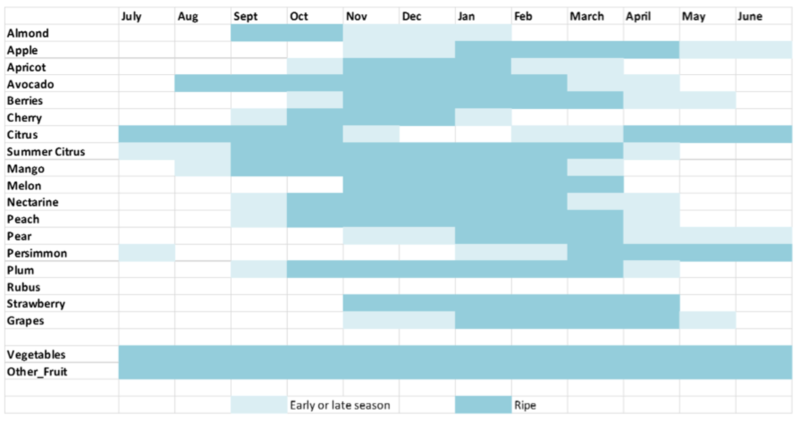 Guide to host (fruit and vegetable) ripeness and crop timing for southern Australian produce. 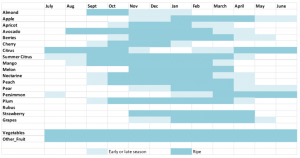 There may be some regional and varietal differences in the start and end of cropping periods. Qfly do not need hosts when it is not egg-laying time – just somewhere to live, and that is ‘habitat’. Habitat is equally as important as hosts. Keep an eye out for flies outside your crop in places that give shelter from the heat (near water courses and dams), the cold (near sheds and other structures), the wind (in windbreaks or remnant vegetation). For example, high numbers of Qfly have been trapped in remnant eucalypt forests during the middle of summer. In temperate regions in summer, Qfly numbers are influenced by rainfall, possibly because moisture in the air and soil encourages pupae to emerge. Urban areas often provide ideal environments for Qflies; they provide warmth and shelter, food and water, and have a ‘fruit salad’ of available host plants. Many fruit crops grown commercially are potential hosts, and growers are adept at managing pests and diseases on-farm. Other landscapes pose a real risk for fly re-entry. The Adaptive Area wide management of Qfly using SIT project is being delivered by Hort Innovation in partnership with CSIRO, and is supported by funding from the Australian Government Department of Agriculture & Water Resources as part of its Rural R&D for Profit program. Further partners include QUT, Agriculture Victoria, NSW DPI, PIRSA, SARDI, Wine Australia and BioFly.